Mornings for me consist of chaos, being a mad rush getting ready for work in the morning and get the children ready for nursery and school. Even leaving the children’s things laid out for nursery/school or on my days off, it still seems a mad dash to get the children up and out the door. So I’ve really tried my hardest to be more organised recently, which comes mostly down to being prepared the night before. That means clothes laid out for all of us, pack lunches made, school bags ready, my handbag by the door with everything I want in it! If I’m working, it’s usually my husband that takes them to school due to his shift work, but that means I need to be up quick and out the door often not having time for breakfast. An essential I keep in my bag are a healthy cereal bar or a pack of the new Crunchy belVita Breakfast biscuits! At work I find them a handy snack on my desk that I can nibble at during the morning. There are three quite chunky biscuits that do fill you up and are rather tasty. Coming in hazelnut, choc chip and apricot flavours, I can actually say I recommend all three!! Being honest I do think the hard crunchy texture tastes best dipped in a hot drink which is something I only achieve on the days I don’t work. E.g. on a Thursday I’m at home with my youngest, we walk my eldest round to school, then come home again. I don’t normally eat breakfast myself before the school run so when I come back I make myself a cup of Twinings detox tea (the only kind I drink!) and enjoy it with a pack of Belvita. I honestly enjoy all three crunchy flavours, choc chip is moreish, hazelnut has a lush nutty taste and apricot has a fruity bite – they are all really tasty!! What I really find great with Belvita, is that they are handy to keep in my bag as a a breakfast snack or as a mid morning snack at home with a hot drink. The best bit is they come in a pack of three biscuits #MorningWin, great portion control which I love – if it was a an endless pack I wouldn’t know where to stop! Belvita for me are a great snack that is versatile and tasty, take it with you, on the go, or have a home – a win win for me!! 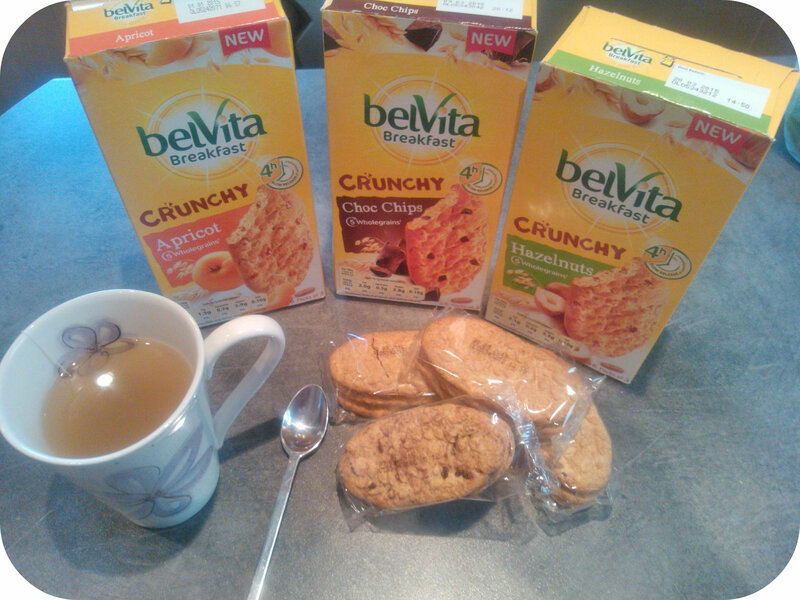 This post is an entry for #MorningWin Linky Challenge sponsored by belVita Breakfast.